Something Rotten & First Among Sequels – my books. my life. I try really hard to review everything I read, even if it’s a reread. Well, I have gotten behind this year. And I really don’t read fast enough to ever justify being as far behind as I am. But it happens. 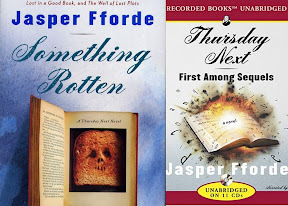 Earlier this year, I reread the entire Thursday Next series on audiobook before the the newest book, One of Our Thursdays Is Missing, was released. I discussed the first three books here and here. And I really want to discuss rereading the rest of the series, but I’ve kind of forgotten what I wanted to say. So can I just give you a brief synopsis of the books and one or two thoughts on them? Yes? Thanks. You are the best readers ever. In Something Rotten, Thursday returns to the real world with little Friday, Pickwick, and Hamlet in tow. There she finds Yorrick Kane taking over England and blaming everything bad on Denmark. Once again, Thursday must come to the rescue. This time by playing croquet. In First Among Sequels, we fast forward fourteen years. Friday is a surly teenager and Thursday and Landen have added two more children to their family. Spec Ops has been disbanded and Thursday lives a quiet life running Acme Carpets. Except for the secret Spec Ops work she still does. And the secret book world work. Oh, and it turns out time travel was never invented in the future and they are quickly hurtling toward the end. Unless Friday (but the surliness!) follows his destiny into the Chrono Guard. Once again, I thoroughly enjoyed rereading these books. We had another new narrator for these two, Emily Gray, and she was just as fabulous as the last two. I thought I would hate the narrator changes but everyone was so good that I quickly adapted and now I love all of them equally. If you haven’t read these books before, I recommend reading them in print. They are a bit confusing and it’s nice to be able to flip back. But if you’re looking for a reread, please give the audio a chance. PS – Do you get the little joke? Reviewing Thursday Next on Thursday? I’m hilarious, right? These are some of my favorite books, but I need to read the newest one to be current with them. I love Fforde so much, and think he is just hilariously funny and relevant and interesting. I am so glad you are a big fan of these too! Reviewing Thursday on Thursday, I love it. I’m up to First Among Sequels in this series. I need to read that one before the latest. I’ve loved the first four books though and I can’t wait to read the next one. I’m so conflicted, Michelle totally hated the narrator change… Maybe this should just convince me to get back to them in print because I own all but the newest and have only read one.